June was an interesting month in the capital markets. The S&amp;P 500 rose ever so slightly, but the rest of the world was experiencing bigger moves. The yuan is experiencing one of its biggest sell-offs in years, which is also pressuring other emerging market currencies. This in turn is prompting stock selloffs and rising yields. Foreign stock markets, both developed and developing, have largely posted losses for the year. Fears of a trade war are only adding to the problem. Short term rates continue to edge upwards in the U.S., and stock market liquidity has become increasingly shallow as traders lack conviction in either direction. Eyes now turn to corporate profits and GDP numbers to fuel further price gains. Oil prices jumped over 8% in June on news of continued inventory declines around the world. For the year they are up almost 20%. President Trump has publicly commented on rising gas prices, putting pressure on OPEC to increase production, but so far the oil cartel has made no official changes. The safe haven of gold, which is a non-interest-bearing investment, usually struggles in a rising rate environment, and this time is no different. The yellow metal fell 3.75% in June and is down just over 4% year-to-date. Rising rates and struggling foreign stock markets are also positive for the dollar. The dollar index inched up again in June, by 0.69%, and is up 2.73% year-to-date. The ISM Manufacturing PMI in June was 60.2%, a bit higher than the May reading, and still showing strong economic expansion. The non-manufacturing, or services, index came in at 58.7%, also showing continued strong expansion. The Commerce Department released its final estimate of first quarter growth, with a slight upward revision to a 2.2% annual growth rate. The National Association of Realtors reports that existing-home sales in June were 0.6% lower than in May, and are 2.2% lower than they were a year ago. The median home price rose 5.2% to $276,900 from a year ago. Median home prices are now at an all time high, and have been rising for the past 76 months. The average 30-year mortgage rate in May was 4.57%, down slightly from the 7-year high of 4.59% attained the previous month. Distressed sales (foreclosures and short-sales) were 3% of total sales in June. Both major stock market crashes in recent memory (the late-90’s dot-com bubble and the housing-fueled bubble of 2008) were preceded by a period of rising rates. But the data also shows this isn’t always cause-and-effect. Rising rates in both the 80’s and earlier in the 90’s coincided with a rising stock market. From an investing perspective, we could talk ad nauseam about differences and similarities between then and now. 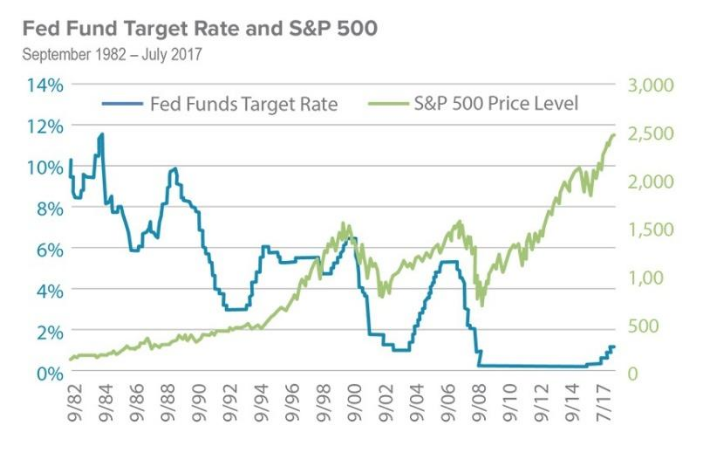 Some argue rising rates are ultimately good for stocks, others argue the opposite. There is the additional wrinkle of significant tax cuts during this round of tightening. When Clinton cut taxes for individuals, by slashing the capital gains tax, this led to a roaring stock market. It isn’t clear that corporate tax cuts will have the same effect – but perhaps they will. Still, we know that there is a finite amount of capital in the global system, and stocks and bonds are somewhat in competition with each other. When stock valuations and P/E ratios are at historic highs, as they are today, it does seem to make sense that rising rates pose more of a threat to the stock market. No surprise, then, that the S&P 500 is barely positive for the year, and many other stock markets are in negative territory. From the perspective of long-term retirement income, it seems prudent to have a little less exposure to stocks, rather than a little more, as the Fed signals increased tightening over the coming year. And as always, please feel free to forward this to friends and family. This material was prepared by Greg Naylor, and all views within are expressly his. This information should not be construed as investment, tax or legal advice and may not be relied upon for the purpose of avoiding any Federal tax liability. This is not a solicitation or recommendation to purchase or sell any investment or insurance product or service, and should not be relied upon as such. The S&P500, MSCI EAFE and Barclays Aggregate Bond Index are indexes. It is not possible to invest directly in an index. The information is based on sources believed to be reliable, but its accuracy is not guaranteed. Investing involves risks and investors may incur a profit or a loss. Past performance is not an indication of future results. There is no guarantee that a diversified portfolio will outperform a non-diversified portfolio in any given market environment. No investment strategy can guarantee a profit or protect against loss in periods of declining values. Listed entities are not affiliated. Disclosure: Advisory services offered through Capital Asset Advisory Services, LLC, a registered investment advisor. This site is published for residents of the United States only. Investment Advisor Representatives may only conduct business with residents of the states and jurisdictions in which they are properly registered. Therefore, a response to a request for information may be delayed until appropriate registration is obtained or exemption from registration is determined. Not all of the services referenced on this site are available in every state. For additional information, please contact Kim Creque at kimcreque@fiatwm.com. Fiat Wealth Management does not offer legal or tax advice. Please consult the appropriate professional regarding your individual circumstance. To view our ADV part II, please click here.